This dB calculator will help you find the sound pressure level (SPL) and intensity level in decibels. You can use it for dB conversion or for determining the distance from the source of sound. Make sure to try our wavelength calculator if you want to know the frequency or speed of the sound waves as well. When we hear a very loud noise, we experience unpleasant feelings. It is because of the pressure of a sound wave. Even though this pressure can be measured in Pascals, like air pressure, it is more practical to use decibels - a logarithmic unit. The sound pressure level, or SPL, is simply the measure of sound pressure with reference to hearing threshold. Pref is the reference value of sound pressure. Typically, it is assumed to be equal to 0.00002 Pa.
Sound intensity is defined as the sound wave power per area. It is a special quantity that allows us to measure the energy of sound (or, to be more precise, the energy per second per one squared meter). Iref is the reference value if sound intensity. Typically, it is assumed to be equal to 10^(-12) W/m^2. Sound intensity changes with the distance from the sound source. It's just common sense - if a car passes you, you hear a loud noise that gets quieter as the car moves away from you. This phenomenon is also known as distance attenuation. where R is the radius of the sphere - the distance from the sound source. Our decibel calculator can be used for finding the equivalent of sound wave pressure in decibels. 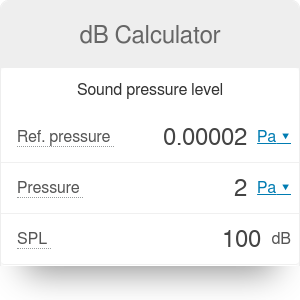 Simply type the pressure in pascals into the dB calculator to find the sound pressure level. You can also use this tool in reverse, to find the pressure if SPL is given. If you're interested in acoustics, make sure to take a look at the reverberation time calculator, too! dB Calculator can be embedded on your website to enrich the content you wrote and make it easier for your visitors to understand your message.